Are you interested in learning about typical concierge duties at a hotel? If you are considering a career in the hospitality industry and like the idea of working directly with the guests, this type of job may be an excellent choice for you. A concierge is a hotel employee who assists guests with a variety of needs. Concierges focus on helping guests save time and ensuring that things are as convenient and pulsant as possible throughout their stay. 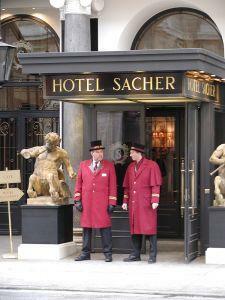 Most concierge duties at a hotel involve the hotel guests. The most basic duties include finding the best places for dining and local entertainment. For example, guests who want to eat sushi and are unfamiliar with the area may ask the concierge where the closest or the best sushi restaurant is located. Concierges may give their recommendations from personal experience, especially if they are from the area, but often times, the concierge will consult online reviews and databases in order to inform the guest. The concierge may give listings of two or three restaurants along with the positives and negatives (if any) of each. The concierge may also make reservations on the guest's request. Concierges also often help guests find local entertainment venues and events. Because of this, concierges must stay up-to-date with local concerts, sporting events, and other activities. They should have a good knowledge of things-to-do locally. Besides dining and entertainment, the concierge may also direct guests to doctors, dentists, veterinarians or hospitals in case of an emergency, making appointments for guests as needed. Other concierge duties at a hotel also include anything that can make the guest's hotel stay more comfortable and less troublesome. This could include everything from arranging transportation to helping arrange for delivery of flowers, and more. If you know this is the type of career you want to pursue, you may want to consider obtaining a two- or four-year degree in hospitality services. These types of program typically include courses in hospitality, business, tourism, customer service, and more. However, there is not a specific educational or certification requirement to gain employment as a concierge. Someone who exhibits the right set of skills and customer focused personality may be hired for this type of job without formal training. Additionally, in many cases, entry level hotel employees who really shine are often promoted to this position. Excellent networking skills: Getting to know restaurant owners and staff or other people who work in industries you may need to contact is vital to making hotel guests happy. Time management skills: Being able to get things done in a short time is essential for success in this type of job. Often, guests need a task or reservation done quickly. If you procrastinate or feel you don't have a sense of urgency, then becoming a concierge is not for you. Multi-tasking skills: A concierge must have the ability to handle multiple requests, as the hotel will have many guests with different needs daily. Becoming a concierge can be a rewarding job because you have the ability to make a lot of people happy in a day.